Almond blossoms in my neighborhood of Har Adar. What a briefly blossoming biblical tree can teach us about a much-needed dose of hope. Time to ‘fess up about what I’ve been hiding in my how-are-you-we-are-fine emails these past months: Husband Arik’s winter has been a bit on the Jobian side. Alright, I exaggerate; there have been no fatalities, and I suppose it compares favorably with what goes on in the lives of some of you, or of people who sat beside us in the Sha’are Zedek emergency room last week, or in any of the other ERs we’ve visited over the past months. And granted also, there has been no divine pride in righteousness, no diabolical bargains over Arik…that we know of. 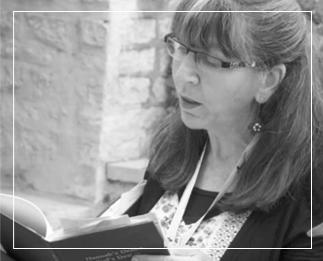 The proverbial Sabeans (Job 1:15) had already taken away quite a bit away from Arik back in 1973 when he first became a wounded warrior confined to a wheelchair. Over the years he’s had his challenges, but in May came the car that rammed into his car, the broken bones, his mother’s difficult recovery, the pressure sore. Now, just as that has begun to heal, came the next travail. That’s the one that made me think of Job. No dung heap, no potsherds for the itching, burning, rip-roaring pain, but yet of all things, at all times…shingles. In the head. Let’s all open our Bibles to Job Chapter 3. “But that’s not what it says,” I protested weakly. She put the doctor right on the phone. Uh oh. A lot of loving attention by our faithful family physician, another week, and another specialist, different meds, a different protocol, and the pain has finally being brought under control…hopefully. Just in time for the blossoming of the almond tree. “Jeremiah, what seest thou? And I said: I see a rod of an almond tree… Then said the LORD unto me: ‘Thou hast well seen; for I watch over My word to perform it” (Jer. 1:11). In Hebrew, almond is shaked, which comes from a root word meaning diligence. Now that you know this, you can appreciate the prophet’s play on words. 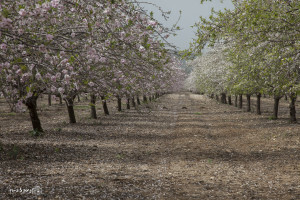 The almond is our version of the groundhog, ever on the watch for the passing of winter so it can announce that spring is on the way, which it does by being the first fruit tree to bloom, painting the hillsides of Judea and Galilee in pink and cream. It’s the almond pit that we find so delicious, unlike its relatives, the peach and the plum – where it’s the surrounding fruit we like. But by the way, the fruit of the immature almond – tart and fuzzy, dipped in salt – is an acquired taste that I first learned about after moving to Israel. Deliciously bitter. Go figure. In Numbers 17, the almond appears as a symbol of vigor. That’s because Moses created staffs for each tribal leader and planted them at the entrance to the Tabernacle, but only Aaron’s staff budded and produced almonds, within 24 hours yet. 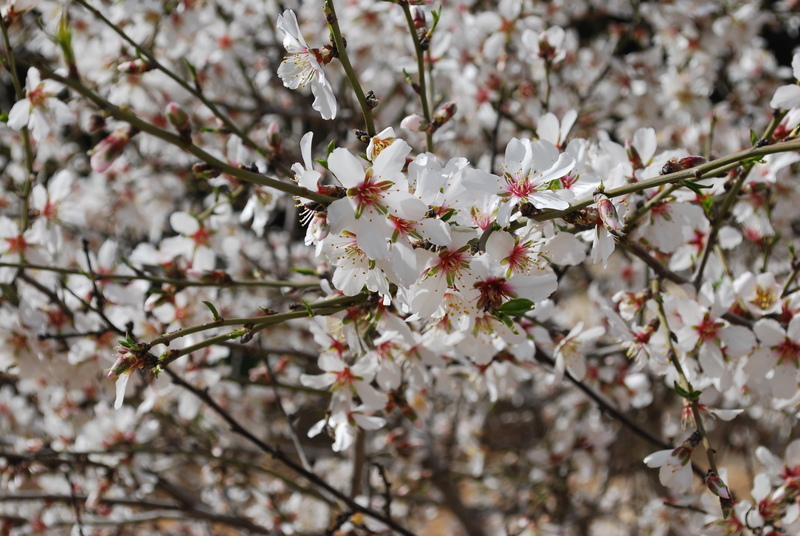 Ecclesiastes takes the almond to another place entirely, using the whiteness of its flowers to symbolize the whitening hair of old age: “When men are afraid of heights and of dangers in the streets, when the almond tree blossoms and the grasshopper drags himself along… (Eccles. 12:5). The sages of the Talmud mention the many benefits of the almond (which botanists tell us originated in Central Asia, spread to India and eventually to the Middle East) including a delicious paste, relish and oil. The first-century physician Discorides mentions almond oil and sap as a treatment for stomach pain, headache and burns. The fifth-century doctor Assaf Ben Brachiyahu (“Harofeh”) recommended almond oil to strengthen the heart, for breathing problems and kidney stones. And Prof. Ephraim Lev of the University of Haifa tells us that in 12th-century Jerusalem physicians used an almond and sugar concoction as a medication. 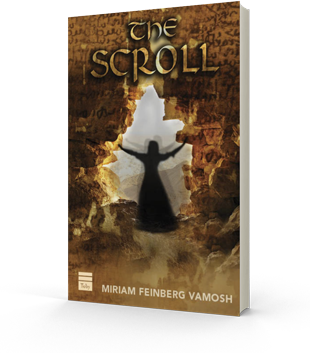 But back in the realm of symbolism, the biblical “watchfulness” of the shaked has its dark side, too. Daniel 9:14 uses the same word to tell us that God “watches upon the evil” – as a way of warning us that sin will be punished. Let’s ask Job what he thinks of that one, shall we? Instead, as we all anticipate an end to our bitter days, whatever form they may take, I hope we can find in the early flowering of the almond, as Jeremiah did, an encouraging symbol joy and renewed strength that comes with spring: “And it shall come to pass, that as I have watched over them, to destroy and to afflict…so will I watch over them to build and to plant” (Jer. 31:28). 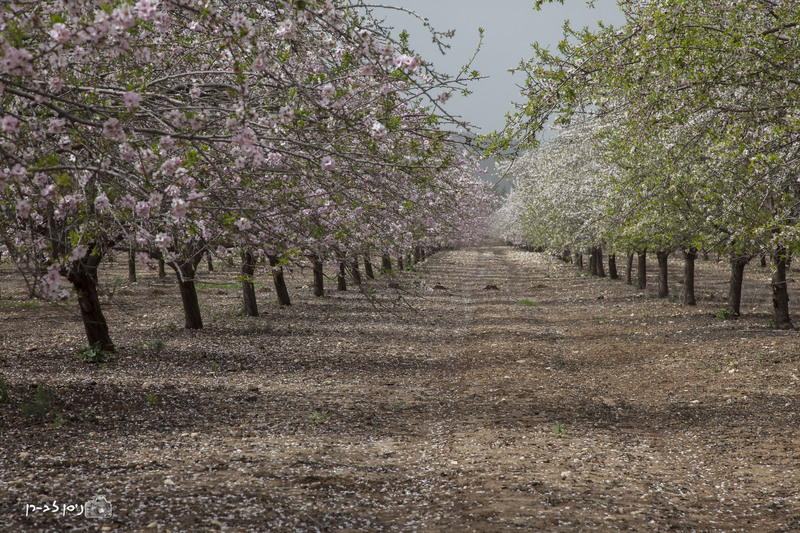 An almond grove in Israel. Photo: Nissan Lev-Ran. Pikiwiki Israel. So well written, so personal, so self explanatory,so interesting! So very beautiful bringing in the past and an optimistic future with full healing for Arik. Hello Miriam! I’m glad to read your story, but sorry for how hard it’s been. Life is sometimes that way. Praying that this year is brighter and easier, and that love and joy strengthen and sustain you!